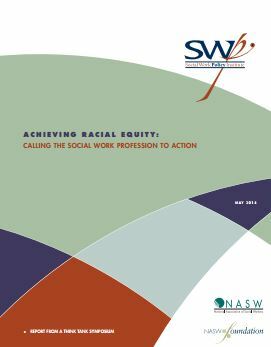 A think tank symposium, Achieving Racial Equity: Calling the Social Work Profession to Action , was convened under the auspices of the NASW Social Work Policy Institute (SWPI) on November 17-18, 2013 in Washington, DC. 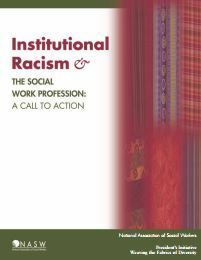 The interdisciplinary group of participants, including social work stakeholders and race equity experts, worked together to more fully understand the roots and manifestations of institutional and structural racism; and to identify principles, practices, and analysis that can be effective for undoing institutional and structural racism. The Action Brief highlights the strategic actions and targeted recommendations that were developed to move this important work to address the many manifestations of institutional and structural racism forward. The full report includes summaries of all of the presentations, the recommendations, biographies of the speakers and an appendix with useful resources that can be helpful in undertaking efforts in agencies, in professions and in communities to address institutional racism. The NASW Foundation thanks Casey Family Programs (www.casey.org) for their partial support of the symposium; and thanks the planning group (Mary Pender Greene, Sandra Bernabei, Joyce James, Meizhu Lui and Bayard Love) for their extensive work with SWPI Director, Joan Levy Zlotnik, to plan the symposium and to develop the report. The symposium speakers included Eduardo Bonilla-Silva (Duke University); Ron Chisom, Kimberly Richards and Diana Dunn (The People’s Institute for Survival and Beyond); Joyce James (Race Equity Consultant); Ralph Bayard (Casey Family Programs); Diane Bell-McKoy (Associated Black Charities); Erline Achille (Boston Public Health Commission); Mary Flowers (City and Region of Seattle); Joseph Barndt (Founder, Crossroads Ministry); Ruby Gourdine (Howard University); Joshua Miller (Smith College) and Laura Lein (University of Michigan). The symposium also brought renewed attention to the strategies outlined in NASW’s Institutional Racism & the Social Work Profession: A Call to Action (2007) tool-kit and built on NASW’s leadership in development and promulgation of standards and indicators for achievement of cultural competence in social work practice (NASW 2001 ; NASW, 2006 ); recognizing that there is also a need to develop a practical and actionable racial equity framework to better understand how our systems and services are structured.